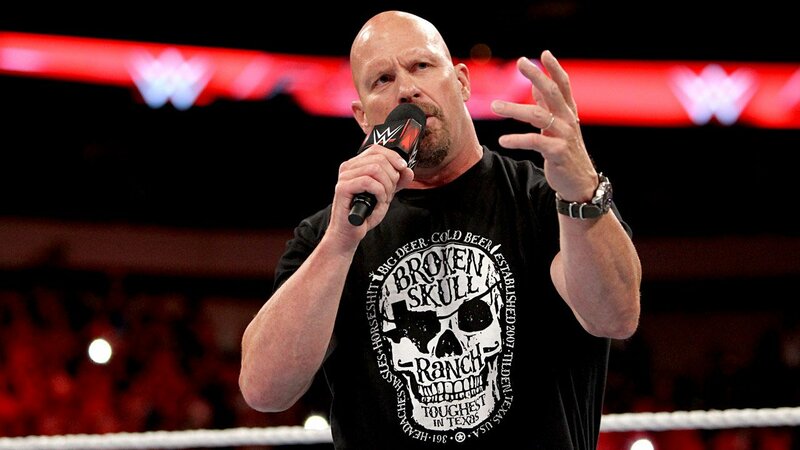 While it’s become clear that WWE Hall of Famer “Stone Cold” Steve Austin won’t be wrestling this coming April at AT&T Stadium, there’s still a very good chance that he’ll have some kind of role on the show, that is, if WWE and the “Texas Rattlesnake” can agree on what that role will be. According to the Wrestling Observer, WWE has still not come up with, or pitched, an idea to Austin for WrestleMania 32. However, it’s very likely that WWE will come up with something for Austin in the near-future, as they’ll probably want to have him appear on the show, given it’s in his home state of Texas. Austin appeared on Jim Ross’s podcast, the Ross Report, several weeks ago, and he said that he’s 99 percent sure that he’ll appear on the show. Then Austin went on to explain that he had an idea that he wanted to run by Vince McMahon that he was really excited about. It’s expected that Dwayne “The Rock” Johnson will be in the corner of Roman Reigns in the main-event of WrestleMania 32 to counteract Vince McMahon, who will be in Triple H’s corner. So, if that’s the plan, then Austin likely won’t be involved in the show’s main-event. Since his official retirement in March of 2003, Steve Austin’s role at previous WrestleMania events has largely been as a special guest referee — in 2004 he refereed Goldberg vs. Brock Lesnar, in 2007 he refereed Umaga vs. Bobby Lashley, and in 2011 he refereed Michael Cole vs. Jerry “The King” Lawler. In several interviews following his last referee gig, Austin said that he thought him doing the special referee thing was a bit burnt out, and if he was going to come back for something, it’d have to be for something other than a spot as a special guest referee. There has been some speculation that Austin will end up being the host of this year’s WrestleMania, which is something that The Rock did in 2011, and Hulk Hogan did in 2014. It’s unclear exactly when Steve Austin will meet with Vince McMahon to discuss his role at WrestleMania 32, however, Austin is scheduled to be at RAW this coming Monday to interview Big Show for his podcast, which will air live on the WWE Network following the show. So, there’s a good chance that Austin and McMahon will meet with each other on Monday. Last summer, Steve Austin and Paul Heyman strongly teased that there would be a match at WrestleMania 32 between Austin himself, and Heyman’s client Brock Lesnar, and while it’s pretty clear that the match will not end up happening, there’s a possibility of Austin being somewhat involved in Lesnar’s match on the show, which will presumably be against Bray Wyatt. As of right now, there’s not a whole lot of options for Austin that would make sense, however, that could all change on Monday.